I arrived home from my Sunday afternoon stint of work, errands, and social calls (and the sixteen-plus miles of cycling all that involved) to find a present on my front porch. There are Chinese characters on the other side but a half hour's googling didn't help me out, so I'm going with something generally positive, and if you read Chinese and recognize these characters as "You will be the next to die," don't tell me, okay? 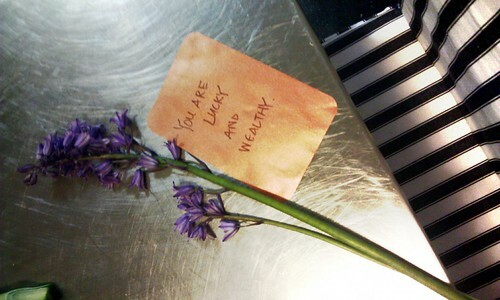 Not a clue who might have left it, but it felt quite magical.